Monthly Inland Revenue Department (IRD) returns are made up of two forms, the Employee Monthly Schedule EMS/IR348 and the Employer Deductions form (EDF/IR345). 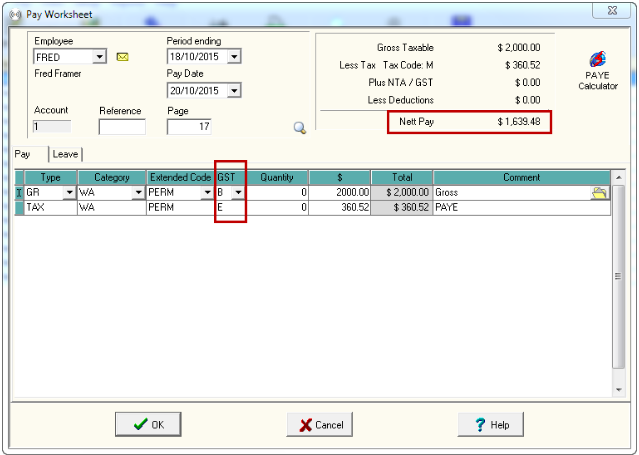 If wage information has been omitted from an IRD return for the period the wage occurred in, an adjustment needs to be made to move the wage information into the correct return. Payment also needs to be made to the IRD to balance the return. Wiremu notices when checking wage records that he transposed the PAYE amount for one employee. Sophie notices when checking wage records that she missed the ESCT portion of KiwiSaver for her employees. Oliver wants to amend a Pay Date for an employee. He normally pays his employee on the last day of the month. Oliver realises that 31 January fell on a Sunday and the payment was not processed until Monday 1st February. The payment was incorrectly included in January’s IRD return when it should be included in February’s. (This also impacts Oliver’s Dec/Jan and Feb/Mar GST returns). When making any corrections or adjustments there are no reversal transactions. The corrections are always done within the original Pay worksheet, and then an adjustment form (IR344) is normally completed to update IRD’s records. Tip: If you have not yet filed your Employee Monthly Schedule (EMS/IR348) for the month in question, you can still make the correction in Cashmanager RURAL’s Wagebook. Once all of your information is correct, file your with the IRD. You only need to complete an Employer monthly schedule amendments (IR344) form if your return has already been received and processed by the IRD. Tip: You will not be able to file a second EMS/IR348 form for the month in question - the IRD’s systems will show this as a duplicate and will not process it. Follow these steps to change your Employee Monthly Schedule. Step 1: Go into Wagebook and change the applicable pay worksheet. Tip: These messages are reminders that changes may impact your returns with the IRD. You will always need to advise the IRD that your monthly return has been amended. You may also need to advise the IRD that a GST return has been impacted. They occur in a time period covered by an already filed GST return. The changes that you have made include changing the GST type and/or changing the Net Pay. Step 2: Update your IRD Return with the IRD. If you only have a small number of adjustments, phone Inland Revenue on 0800 377 772 and they will update them over the phone. You will need your IRD number. Alternatively, complete an Employer monthly schedule amendments (IR344) form (available from IRD’s website). You can amend up to three employees' details per form. Use separate forms if there are more than three. Further information on how to complete an IR344 form is available on the IRD’s website. Employer monthly schedule amendments IR344 form. How to correct your EMS return. Employer monthly schedules: Getting it right.